A new report by the Federation of Small Businesses (FSB) published in May 2016 shows that half of all small firms think the UK’s roads and public transport system have deteriorated in recent years. Only one in 10 (10%) small business owners thought roads and public transport had got better – demonstrating a real need to prioritise infrastructure investment in local and rural road networks alongside big projects on the Strategic Road Network. FSB found small businesses are overwhelmingly reliant on roads, with nine in 10 firms (89%) placing high value on the network. 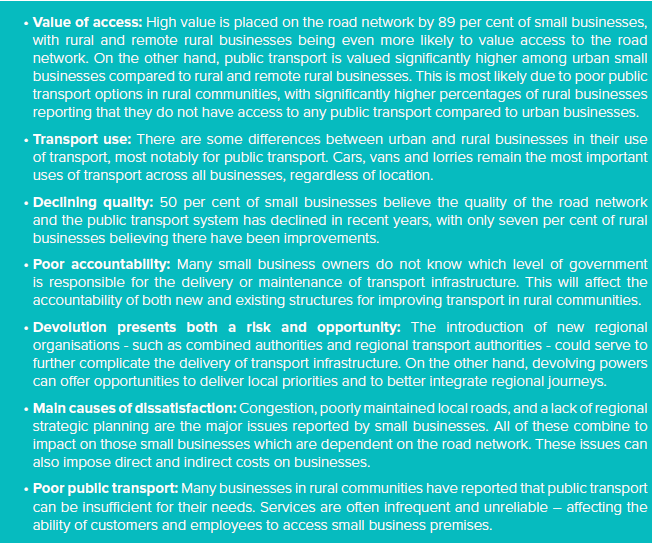 Rural businesses are even more likely to rely on roads as they often report little or no access to public transport links like rail or buses. 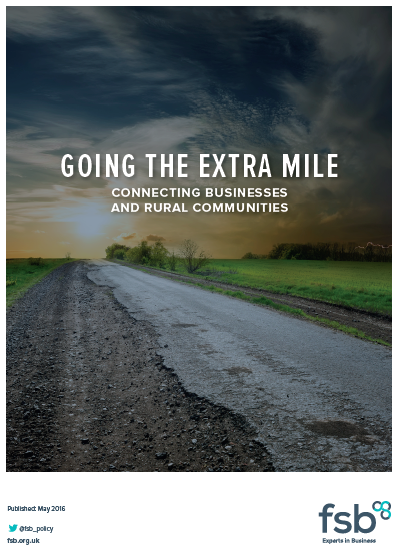 The FSB report, ‘Going the extra mile: Connecting businesses and rural communities’, demonstrates how congestion, poorly maintained local roads, and a lack of regional strategic planning are all combining to pose a significant economic barrier to economic growth – particularly in rural areas. 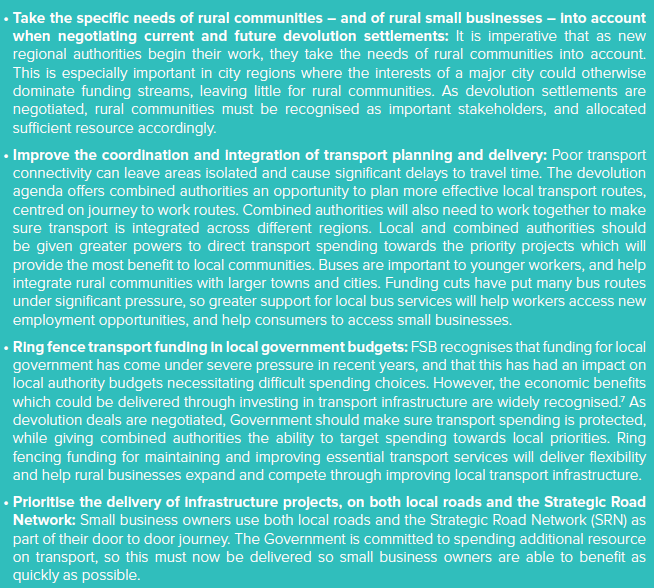 FSB would like to see current and future devolution deals used as an opportunity for new combined authorities to commit to greater investment in local transport infrastructure. Protecting transport spending, alongside better strategic planning, investing in the local road network and public transport will all help support UK small businesses. PlusBike is an all-in-one free information service for combined cycle and rail journeys, it provides bespoke information to help you plan your journey. Rail passengers across England and Wales are set for better journeys thanks to a £20 million pot to fund new stations, announced on 26 August 2016 by the Department for Transport. The next round of the new stations fund will provide up to 75% of the cost for construction of new stations or to reopen previously closed stations. The funding will improve access to the rail network and create new travel, employment and housing opportunities. It follows on from an initial round of funding, which has already made a major difference to passengers’ journeys, with new stations at Newcourt in Devon, Pye Corner in Wales and Lea Bridge in London, and stations at Ilkeston near Derby and Kenilworth near Coventry in the process of being delivered. Organisations such as local authorities, and train operating companies keen to boost local growth are all being encouraged to submit bids. The deadline for bidders for the second round of funding is 18 November 2016 with an announcement of successful projects expected to be made early next year. The Campaign for Better Transport – is calling for four main changes to the Bus Services Bill. Firstly, they are supporting Lord Berkeley’s amendment on Meeting social need. They would like to see the Bill make clear that local authorities have a duty to assess the social needs of their residents, and to secure the transport services appropriate to meeting that need. This duty, in fact, has been established in case law (the Three Rivers case); and has been used by campaigners in Cambridgeshire to fight bus cuts. However, they think that having this duty placed on the statute books will clarify to local authorities that their first duty in planning buses is to connect people to jobs, to healthcare, and to education; and help convince them to protect socially necessary bus routes. Secondly, they calling for a Bus and Coach Investment Strategy. Buses carry more people than any other mode of public transport. Last year there were more than a billion bus journeys – that’s more than double the number of train journeys. But bizarrely, buses are the only mode of transport without a government investment strategy. There is now a Roads Investment Strategy, a Rail Investment Strategy, and this year the Government will be publishing its Cycling and Walking Investment Strategy. The Campaign for Better Transport believes that it is high time that we stopped treating buses as the poor relation, and put in place a long term plan to grow the industry. Thirdly, they would like more clarity in the Bill on enabling local authorities to set minimum standards for buses in their area – whether on bus frequency or punctuality – and deciding the standards that work best for them. Lastly, they want to see the Bill provide strong structures of passenger representation. In the rail industry, bodies like London TravelWatch and Transport Focus act as a passenger ombudsman, taking up passengers’ complaints and providing an independent voice. Bus passengers too should have the right to ongoing involvement and oversight of their local transport services, not just when a franchise or partnership scheme is being developed. The Government is keen that the Bill receives Royal Assent in time for the Mayoral elections taking place in cities around the country in May. It’s therefore likely that it will complete its passage through the Lords by the end of this Parliamentary session, ready to begin progress through the House of Commons in the autumn. We’ll be in touch over the summer to let you know how you can support our calls for a strong bill that works for passengers. Based on an article on The Campaign for Better Transport website. With a grant from the Ouse Washes Landscape Partnership, which is supported by the Heritage Lottery Fund, I am looking at what sustainable public transport options might be introduced to encourage more people to visit the Ouse Washes and the surrounding areas - by means other than by car. The results of this survey will be incorporated into a report with recommendations for the implementation of various options. The Ouse Washes Landscape covers an area of rural Fenland with important engineering heritage, and wetland habitats roughly from Downham Market to St Ives and in between March and Ely. It includes distinctive sites like the WWT Welney Wetland Centre, the Environment Agency’s Denver Complex (south of Downmarket Market), RSPB Ouse Washes (near Manea) and RSPB Fen Drayton Lakes (near Fenstanton). Near to this area, there are also other sites that reflect the Fenland Landscape and heritage like National Trust’s Wicken Fen, Prickwillow Museum and the Stretham Old Engine. There are also a number of other rural tourist/leisure related businesses. 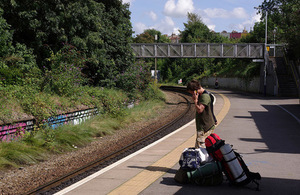 The area is well-served by five railway stations that enable people from other parts of England and further afield to visit the area. 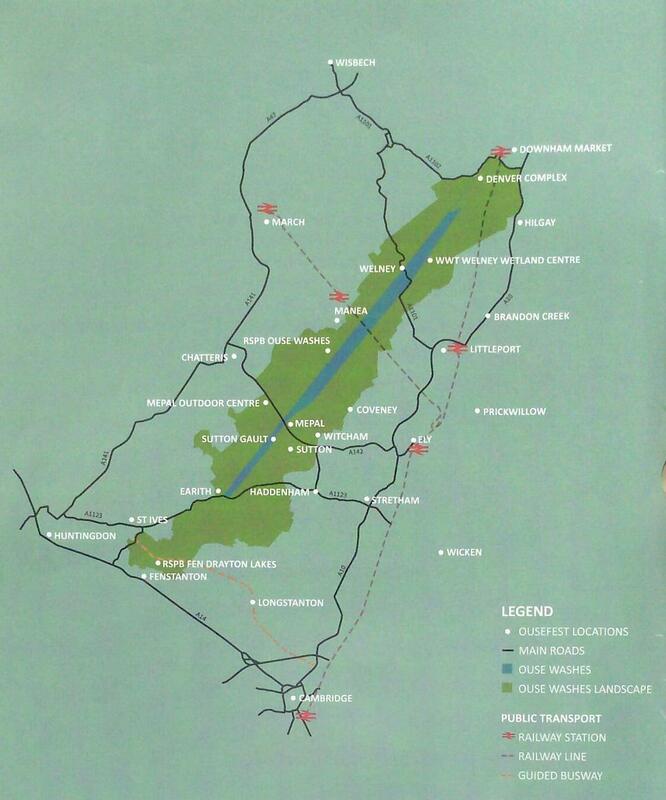 However, access to public transport in the area is variable ranging from a regular guided busway service in the south between Cambridge and Huntingdon to some of the sites not having any public transport at all. A useful interactive map that merges of car availability by ward and the Census 2011 England and Wales Electoral Wards using Google Fusion Tables. Could be used as a tool for identifying rural areas with low car availability – thus he need for more rural public transport services. Obviously other factors like density of population needs to be considered.